A walk into an antique store in Moose Jaw, SK (looking for thimbles) brought Maxine out of the closet. Literally. The owner had 2 wonderful busts’ on which she displayed her antique hats. And she was not about to sell them. Then I remembered Maxine. She used to come to craft shows with me, displaying fleece scarves and headbands. With a make-over she could become the ‘little bit vintage’ in my studio. 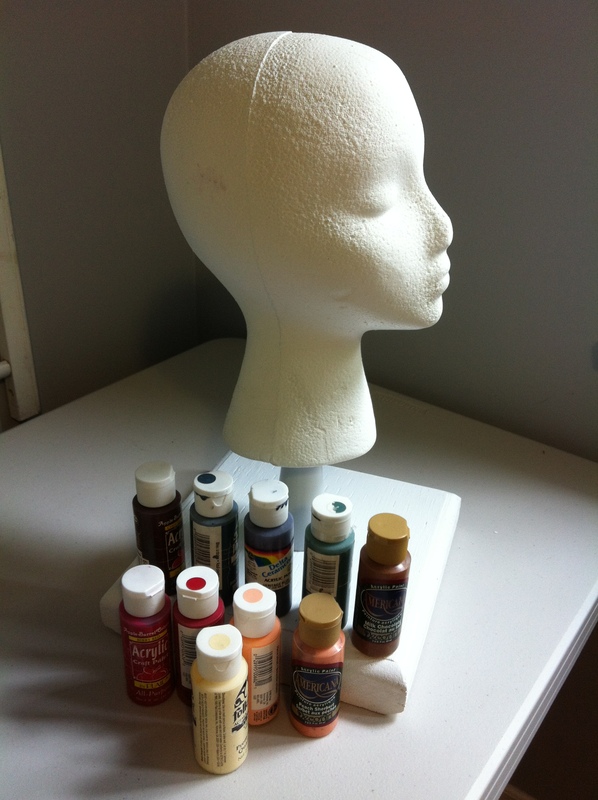 Have you ever tried painting Styrofoam? It must be the worst painting surface ever. I started with white spray paint, thinking it would act like a primer. It didn’t. Instead, it melted the styrofoam. Poor Maxine. Her skin was no longer nice and smooth. Next, came the basic markings for her eyebrows, hairline etc. A pen or pencil did not work so I had to use a felt pen. That provided its own challenges. For one, it did not dry as quickly as it would on paper. When I tried to add her skin colour, her eyebrows were running down her cheeks and her hair down her neck. Fortunately, as easy as it was to have markings where you didn’t want them, it was just as easy to wipe them off. Initially, at least. But once it did dry, it was almost impossible to cover the markings up. After that, the painting was fairly uneventful although the hair required at least 5 coats. Chocolate brown was the first colour that went on. It looked red. Not a pretty red, but a washed out bottle red. Burnt umber, dark brown, black and metallic black helped fix the problem. Now Maxine needs a hat, circa 1920’s. The cloche hat was a popular hat to wear with bobbed hair, but apparently they are not easy to find. Having looked in a number of thrift stores and antique shops without luck, I guess I will have to make her one. 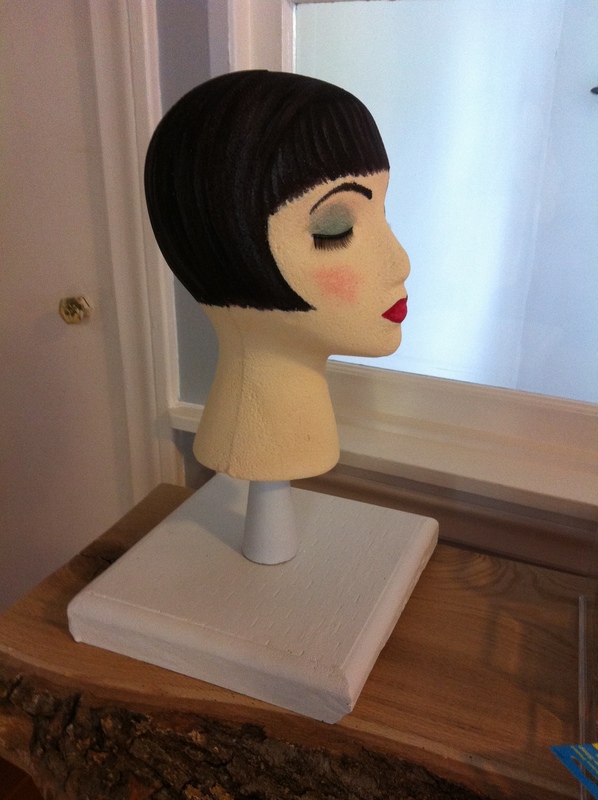 This entry was posted in Uncategorized, vintage and tagged bobbed hair, painting styrofoam, vintage look. Bookmark the permalink.